This mildly spiced curry was originally thought to be created by a hotel in Delhi. 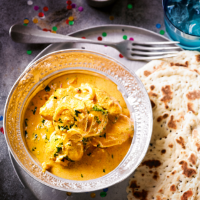 The rich butter and cream help to tenderise the chicken, and it is the perfect alternative to spicy curries. As there is a lot of sauce, what better way to soak it up than with homemade naans? 1. Mix the korma paste and 2 tbsp of yogurt together. Add the chicken, mixing to coat evenly. Marinate in the fridge for 1 hour. for 4-5 minutes until frothy. 3. Place the flour, mustard seeds, salt, baking powder and remaining tsp sugar in the bowl of a stand mixer. Add the oil, egg, remaining yogurt from the curry recipe and yeast mixture, and mix to a dough. Using the mixer’s dough hook, knead for 10 minutes. Transfer to an oiled bowl, cover and leave for 45 minutes until doubled in size. 4. Melt the butter in a large frying pan, shake off any excess marinade from the chicken and fry for 5 minutes, turning halfway through. Add the ginger, chilli, onion, tomato purée and remaining marinade mix, and cook for a further 5 minutes. 5. Pour in the cream, cover and simmer gently for 10 minutes, or until the chicken is cooked through with no pink meat, stirring occasionally. Add the coriander. 6. Meanwhile, knock back the naan dough and divide into 8 pieces. Roll each out on a floured surface to a rough oval shape, around 12cm x 20cm. Heat a little oil in a large frying pan and fry the naans, 2 at a time, for 2 minutes each side until golden. 7. Serve the naan bread with the creamy butter chicken.